Published on Friday, September 30, 2016. This article appears in the October/November 2016 issue of American Craft Magazine. When you come upon Gerhardt Knodel, cutting scallop shapes out of thick fabric in his cavernous studio near Detroit, he is alone – and supremely happy. 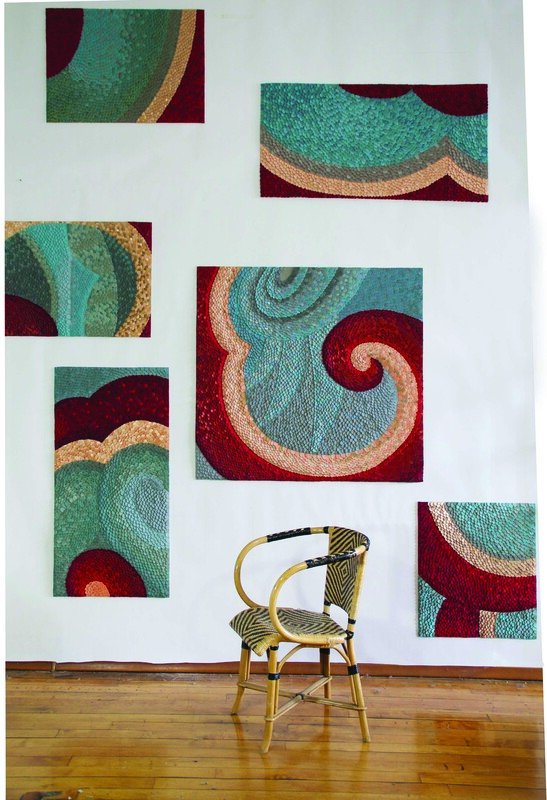 Seeing him absorbed in his latest body of work, which draws inspiration from a centuries-old scrap of patterned cloth, you might decide that Knodel, one of the most accomplished fiber artists of our time, is especially self-reliant and self-possessed. You might think, “Here’s a guy who’s thrilled to be retired from Cranbrook Academy of Art,” where he was director for 12 of the 37 years he worked there. What he recalls most fondly of a six-week weaving workshop at Haystack Mountain School of Crafts in 1967 were the deep bonds that formed between the students as they worked, passionately, around the clock. Before they parted, they sat in a big circle, sipping wine and reflecting. Fifty years later, he still savors “the pleasure of being part of a communal experience of making,” the memory of being in that intense creative circle. Of course, other people are complicated; they don’t always offer cozy fellowship. Sometimes they challenge your perspective – which Knodel also values. He recalls, as a UCLA undergrad and a classically trained potter, watching students of Peter Voulkos manhandle lumps of clay at the wheel in Berkeley – and feeling baffled and amazed. “That was really the first time that I had felt such a major contradiction to something that I had learned,” he says. He returned to UCLA convinced something was missing in his education. When he settled in at Cranbrook in his 30s, he treasured the honest camaraderie, the give-and-take with other faculty leaders, who are artists in residence. They would come together, show their work, he recalls, “and engage in criticism very openly, with a kind of trusting relationship that was based on respect for the differences among us.” He relied on that feedback and grew because of it. Today, though he is working by himself, in a sense he still feels part of a community. Tapping into his vast store of historical textiles, he’s using them as reference points for his own ever-evolving work. As he cuts a piece of mass-produced fabric and arranges it in an assemblage, he’s thinking about the people who’ve gone before. “It’s so interesting that historically, a good part of the world’s population was invested in textile-making,” he says. “It was the preoccupation of 90 percent of human beings.” Here, in his studio, surrounded by “bits and pieces of attention of people from other times and places,” Knodel is hardly alone. And he enjoys the company. 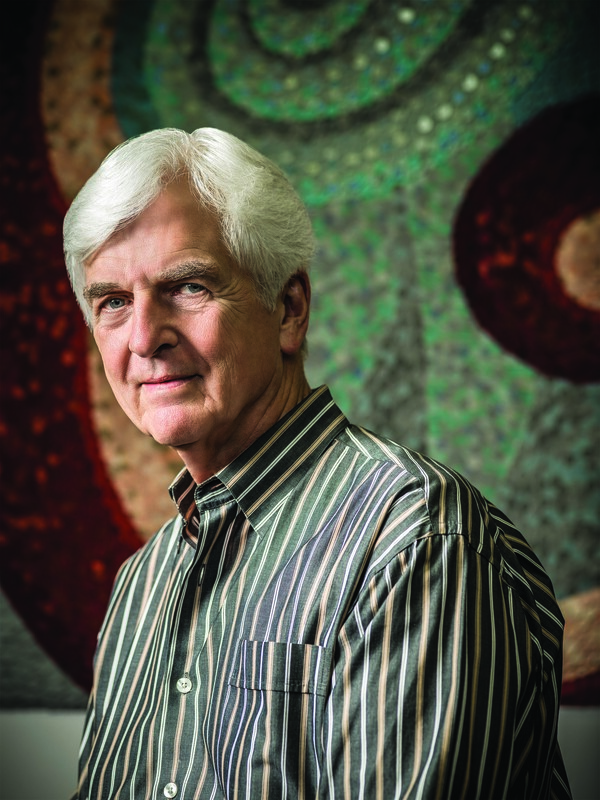 Named to the College of Fellows in 1993, Knodel has balanced art and education at Cranbrook Academy of Art since 1970. He was the school’s director for 12 years, retiring in 2007. Gerhardt Knodel has made mammoth works for most of his career. In the past decade, though, as a full-time artist for the first time in his adult life, he’s been intrigued by smaller forms such as Regeneration #5 (2016). Knodel aimed to “counteract the hard and efficient surfaces” of health care with The Echo of Flora Exotica (2005). 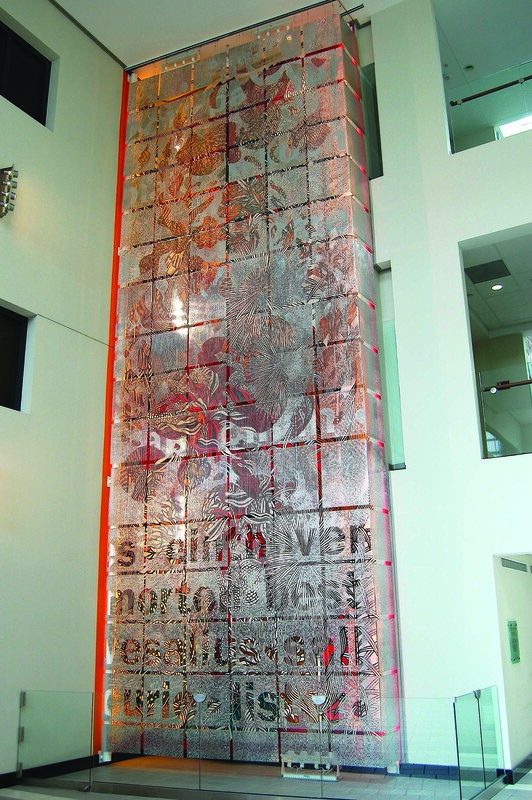 The work, 42 feet tall, is installed at William Beaumont Hospital near Detroit. 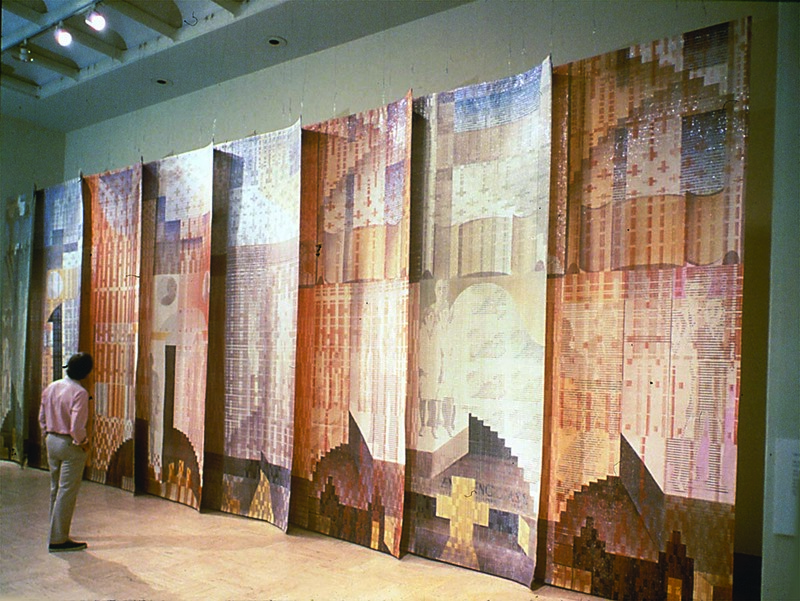 The Pontiac Curtain (1982) uses cotton twill tape painted and printed with dyes before weaving. Knodel was inspired to reimagine historical figurative tapestries by a scene at an Italian cathedral and the struggles of the Rustbelt city of Pontiac, Michigan, where the artist has his studio. 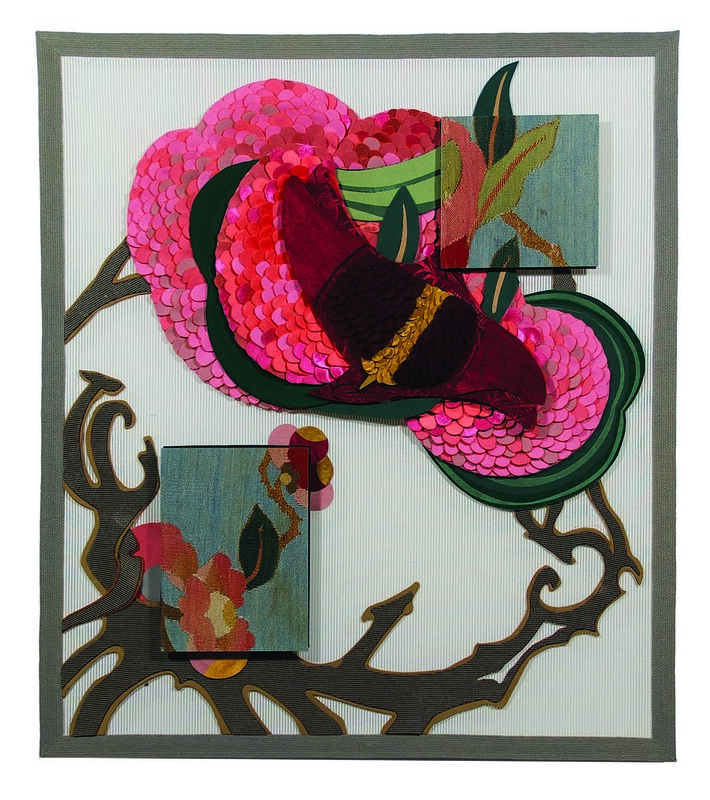 In Things That Get Caught in Trees After a Storm (2016, one of six 29-inch panels), Knodel used fabrics manufactured in China to elaborate on textiles that had significance for other people at other times. The work incorporates photography of a historical textile, a new approach for the artist. 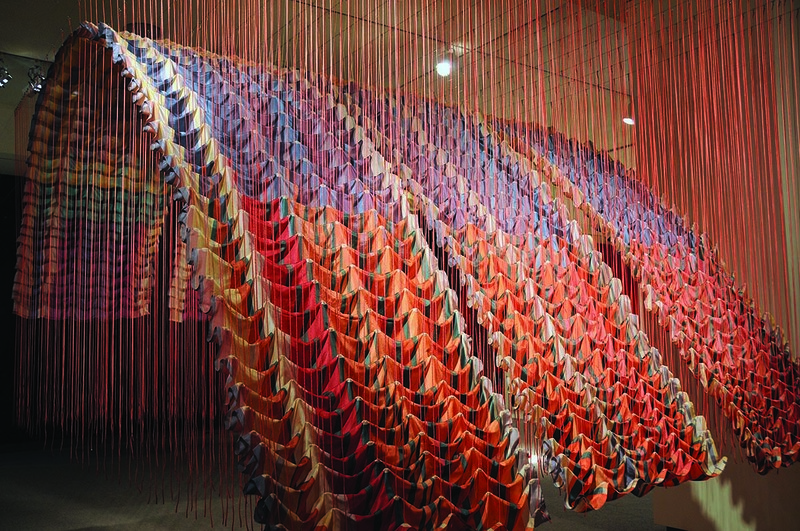 Act 8 (1974), 14 feet deep, uses resist-dyed silk, nylon cord, and steel cable supports. Calvino’s Curtain: Invitation to a Future (2014) incorporates a loose narrative inspired by a 1957 Italo Calvino novel. Made of materials including polyester and Mylar, the 10-by-40-foot curtain expands to more than 100 feet wide. 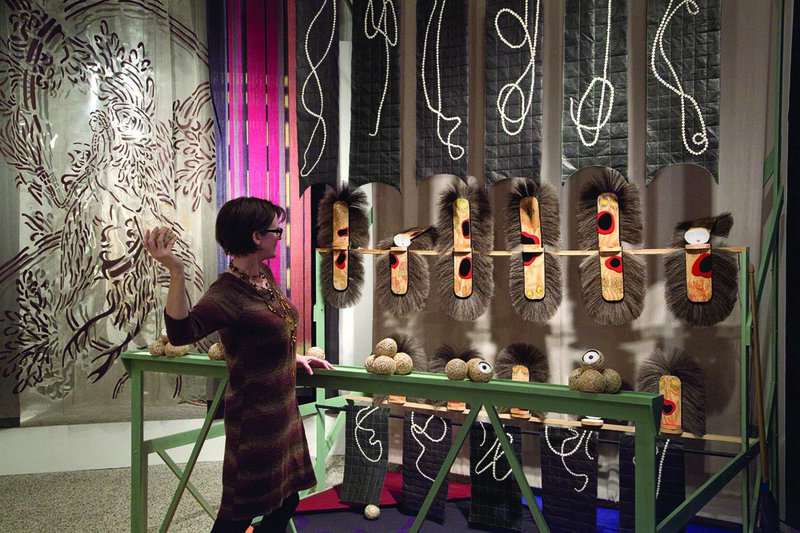 Whoosh (2011), inspired by carnival games, examines the influence of art critics. The viewer is invited to toss balls containing text from Art in America at wooden heads representing critics evaluating the textile panels that hang above and below. The work reflects Knodel’s conviction that viewers must reach their own conclusions about artwork.